The santoor is a stringed instrument, indigenous to the Kashmir valley as a folk instrument. In ancient times it was known as "Shata-tantri-veena", or hundred stringed lute. The santoor is made of maple or walnut wood, shaped like a trapezoid, and the strings are steel. 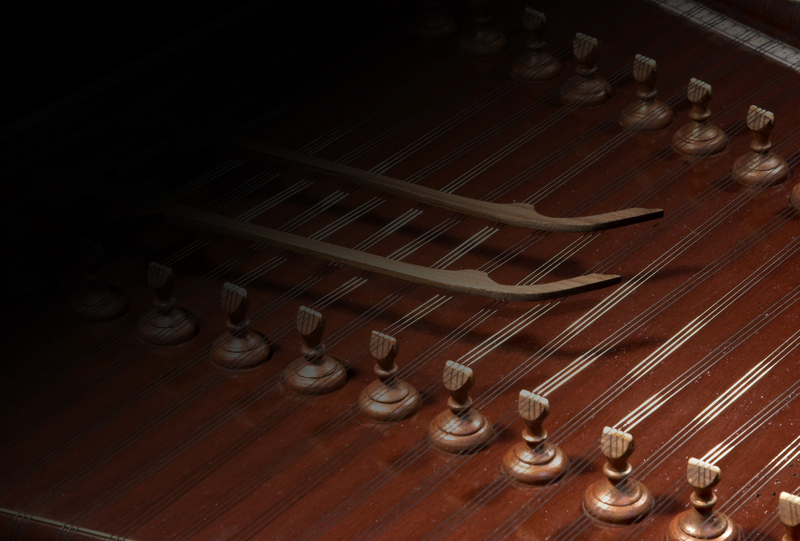 The santoor is played with a pair of curved mallets made of walnut wood. For centuries it was a popular folk instrument, and it was Pandit Shiv Kumar Sharma who elevated the santoor to the status of a classical instrument by making major changes in the design and structure of the instrument, and also introducing new playing techniques. These techniques enable the player to produce the meend, or glissando, required in classical Indian music. The form of tuning was also changed, and made a big difference to the style of playing. The melodic range was also increased to three octaves. Generally, the bridges to the right side of the santoor are tuned to the notes of the raag, and the instrument can also be tuned in a chromatic fashion. Since the santoor is played not by bowing or plucking but by striking, it can be said to be percussive in nature, and as such, offers tremendous rhythmic possibilities.